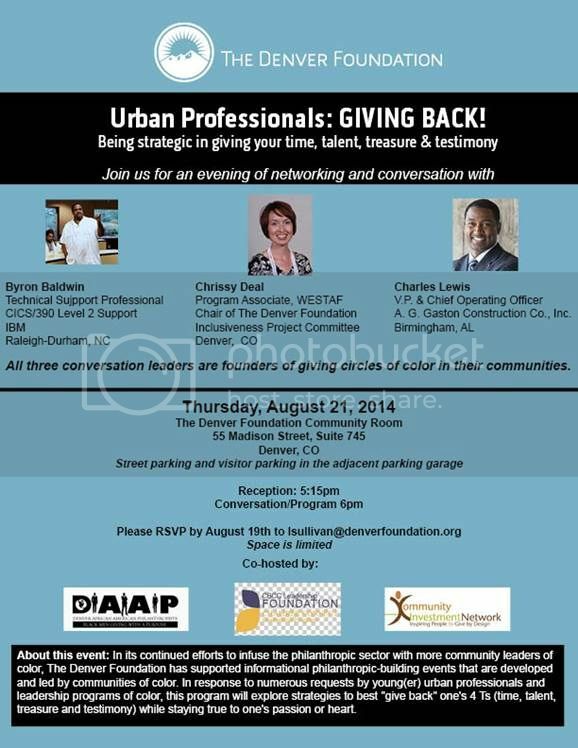 The Denver Foundation will observe Black Philanthropy Month on August 21 with “Urban Professionals: Giving Back!,” an evening of networking and conversation featuring giving circle leaders of color in their communities. The discussion will focus on being strategic with gifts of time, talent, treasure and testimony. Event hosts include Denver African American Philanthropists and Community Investment Network. RSVP by August 19 to lsullivan@denverfoundation.org. In Boston, New England Blacks in Philanthropy (NEBIP) invites you to celebrate Black Philanthropy Month with them as they delve into the beauty of our own image. “IN OUR OWN IMAGE” will be held on August 21 at The Film Posse, Studio 210, located at 15 Channel Center Street from 5:45pm - 7:45pm. To RSVP, contact bcarter@nebip.org. NEBIP is currently embarking on a new study of Black donors in Boston. For more information on Giving Black: Boston and how you can join in the work, visit the website.